Does Taco Bell’s Fast-Casual Entry Have a Chance? Taco Bell is following the lead of its YUM! sister brand KFC, which entered the fast-casual market last year. KFC Eleven features hand-crafted food—flatbreads, rice bowls and KFC Boneless Original Recipe Chicken—in a more contemporary environment. 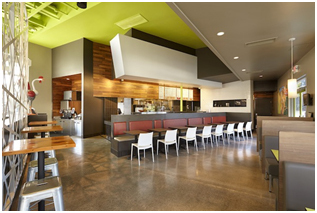 Taco Bell’s new fast-casual concept, U.S. Taco Co. and Urban Taproom, provides the chain an opportunity to move into fast casual while maintaining its identity and value positioning with existing customers in the quick-service segment. Many brands today are trying to shift toward a more upscale menu, food and atmosphere positioning, but this strategy can confuse loyal customers and make it difficult to stay true to the brand identity. Taco Bell’s strategy makes sense and supports its goal to increase sales from $7 to $14 billion in the U.S. market. So what are the challenges this new brand faces? Competition: In addition to a strong independent Mexican restaurant market, today’s Mexican grill segment features strong category leaders like Chipotle Mexican Grill, Qdoba Mexican Grill and Moe’s Southwest Grill. And there are more than 50 other fast-casual chains competing for share of stomach, many of which are growing aggressively. Also within the landscape are successful taco shops that are growing from regional roots in California and Texas like Fuzzy’s Taco Shop, Torchy’s Tacos and Chronic Tacos. The 2013 limited-service Mexican category totaled $18 billion in sales with more than 18,000 restaurants. With so many competitors in the space, finding room for U.S. Taco Co. will be a challenge for Taco Bell’s young “intrepreneurial” team. Price: With price points per-person pegged at $11.50‒$12, many economically challenged consumers may not be able to afford to eat at U.S. Taco Co. on a frequent basis. Average fast-casual price points are still south of $10. And with average prices of fast-casual burritos in the $6‒$7 range, consumers will continue to see pound-for-pound value at Mexican grill concepts. Recent Technomic research with consumers indicated that the optimal price at fast casual for lunch was $7.60, with a high price threshold of about $10. At dinner, consumers indicated that $9 was the optimal price, with $12.50 providing the upper threshold limit. As a result, consumers will likely see this U.S. Taco Co. as a place to go for dinner, as its lunch prices are too high for many consumers on weekday occasions. The One Percenter, featuring fresh lobster in garlic butter with red cabbage slaw and pico de gallo on crispy fry bread. The “Brotherly Love,” a nod to the Philly Cheesesteak, with carne asada steak, grilled peppers and onions, roasted poblano queso and cotija cheese (rather than Cheez Whiz), and fresh cilantro in a flour tortilla. The “Winner Winner,” which features Southern-style fried chicken breast with “SOB,” or “South of the Border” gravy, roasted corn pico de gallo with fresh jalapenos, and fresh cilantro in a flour tortilla. And on the side, guests can get “papas fritas,” which resemble steak fries, coated with habanero dust and served with housemade dipping sauces such as ghost chile ketchup or roasted poblano crema. Guests can also order their fries loaded with taco ingredients sans tortilla as a “secret menu” option. Taking a page out of Red Robin’s play book, the menu will include shakes spiked with beer, and the brand will eventually offer tap, can and bottled craft beer. So how will consumers react? Patience and education will be important to getting consumers to consider an even more Americanized version of a traditional, authentic Mexican taco. 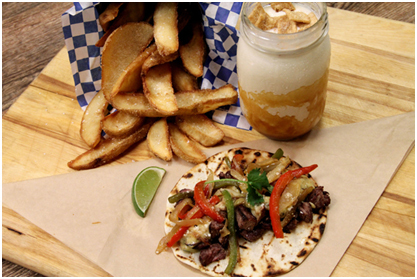 Replacing the American burger with a taco served with fries and a shake will be a new behavior for many Americans. Although this new offering will likely have great appeal for Millennial consumers age 21‒36, Gen X and Boomers will likely continue to lean toward more familiar and traditional meals. As innovation and thinking outside the box (or bun in this case) is essential for filling white space, this new format may be a bit ahead of its time. This entry was posted on Thursday, April 24th, 2014 at 9:36 am and is filed under Fast Casual, Fast Food, Hispanic, Menu Development/Innovation, Menu Trends, Price, Rebrand, Taco Bell, Tex-Mex, Uncategorized. You can follow any responses to this entry through the RSS 2.0 feed. You can leave a response, or trackback from your own site.